Alcatel is back for another bite at the smartwatch pie, with the OneTouch Go Watch going live. A rugged version of the the Alcatel OneTouch Watch that was announced back in January at CES, the Go Watch adds a Casio G-Shock-esque casing to the proprietary OS setup. It also adds a new gimmick - 'Emotional Pulse'. 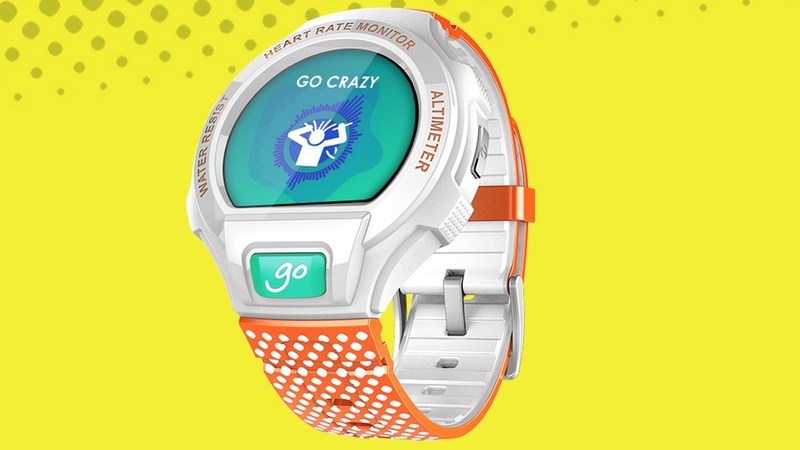 This feature, activated with a press of the big Go button, takes readings from the optical heart rate monitor (which we found very hit and miss with the original), the gyroscope and the accelerometer to offer a mood reading. Readings such as 'Go Crazy', 'Go Love', 'Go Jump' (with a picture of a man jumping out of a plane) and 'Go Scream' give you an idea of just how utterly pointless this new addition is. Of course, you can share your Emotional Pulse with the world instantly on social media - because people's streams aren't already clogged up with enough useless information already. With regards to useful features, Alcatel OneTouch Go Watch is waterproof to 1m - so is suitable for swimming - dustproof and shockproof. Its design is simple to change around thanks to the easy-switch front casing and wrist band, and there's the same 'app' setup as the original. We use the word 'app' loosely here, as some icons simply represent settings such as vibration on/off, airplane mode and brightness. Alcatel hasn't spilled the beans on the display specs as of yet, we do know the build dimensions - the face is 49.2mm in diameter, it's 13.6mm thick and it weighs 55g. It charges using Micro USB and we're told battery life is between 3 and 5 days. We'll let you know if that rings true in our full Alcatel OneTouch Go Watch review. The price is expected to be around €129 and a release date is scheduled for November. It comes in a range of colours.